Wednesday’s NaBloPoMo prompt: If you could connect one-on-one with one expert, what would you want to learn? 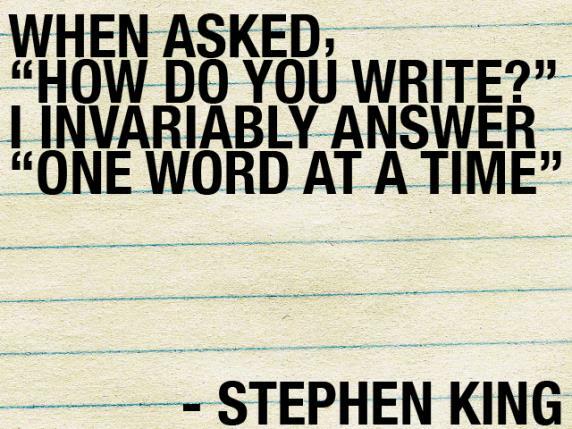 I would love to sit down with Stephen King and have a lengthy one-on-one conversation. I am a huge King fan and have read most everything he has written. I’ve always been curious about what type of person he is to have such a vivid, horrific, and brilliant imagination. I would want to learn about what inspires him, where he gets his ideas, and to get his thoughts on writing. This entry was posted in Life, Nablopomo, Writing Prompts and tagged nablopomo. Bookmark the permalink.